I had spent a little over a year working maintenance between a Buddhist Abbey and a retreat center in Nova Scotia, Canada, and when I returned to my home in Chicago it felt like my neighborhood had sunk even further into economic decay. There were many more vacant lots and houses, many of my neighbors either still unemployed or barely working. At the time, I was overwhelmed with trying to get back in the swing of society, go back to my old jobs, somehow get my new wife who is a UK citizen into the country (we’re still working on that….). What can you do when you are an introvert with no energy, time, or charisma to organize a block club or community garden? Being a printmaker, I made a poster. It was a simple desire to attract positive energy to the neighborhood. The print, with the raccoon and amended Walt Whitman quote was the beginning. I put these posters on abandoned houses, garages, light poles, closed storefronts etc. Why raccoons? Because we have a gang of huge, hearty, bold raccoons that own their part of the streets and houses same as me and my neighbors. They are thriving in what is considered a dying, if not dead, part of Chicago. I felt that there was a lesson to be learned from them, a way to see the richness of our surroundings instead of just the trash. The result however, was to cause my neighbors to think the city had put them up as a warning, that the raccoons had taken over. Clearly, the project had to change, to be clearer, and communicated better. I decided to make them big, and talk to everyone I came across about them. 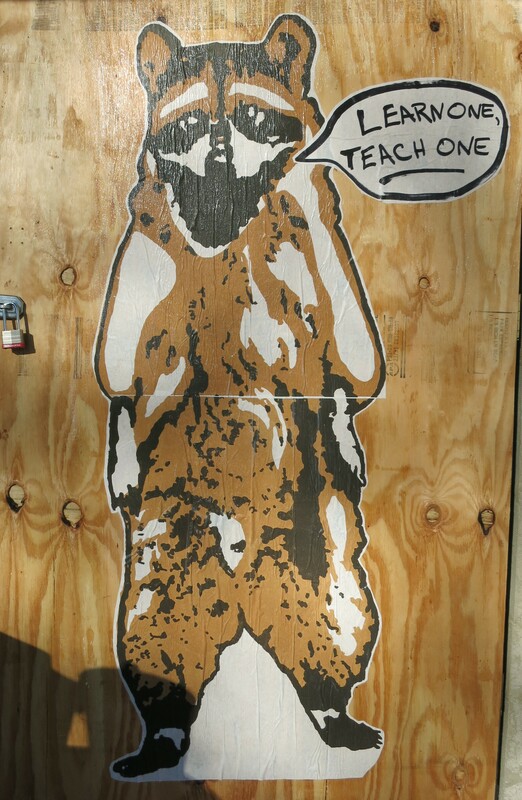 The larger raccoons are 5 feet high, big enough to not be misunderstood as a poster, and the slogans in the speech bubbles are given to me by people I meet in the street and tell about the project. Not everyone reads it as positive, many think it’s a blight on an existing eyesore, insult to injury. Not everyone understands why I do it, even when I tell them directly. Some people think it’s cool. One friend told me point blank, ‘I didn’t know you had this in you’. I had to give up my assumptions of what another person was thinking about my work. It was clear that I really had no idea how it was being seen by others. I cannot control what people think or see or understand. All I can control is my intention and I intend to generate positive energy, to cultivate a peaceful and respectful co-existence with all things. What started with a poster has blossomed into a project about miscommunication, misunderstanding, our interconnectedness, and what simple gestures we can do that fit into our everyday lives. This blog is set up for this new project. Each year, for the past 15 years or so, I have made a card and sent it out to about 80 family and friends. Essentially they are holiday cards, without a specific holiday in mind but usually sent out around Christmas. This year, I had 20 extra cards and decided to give them out to strangers, along with a dollar or two to someone asking for money or as part of a tip. Instead of dropping them in the mail, I handed them to a stranger, told them that I made a card for them, and witnessed a free exchange of a gift and their acceptance of it. That will be the project, making cards, handing them to people (sometimes sending them) and inviting them to visit this website to leave comments, ask questions, or just find out why. I invite you to leave your comments and ask your questions too. And I love your header photo! Your own creation? 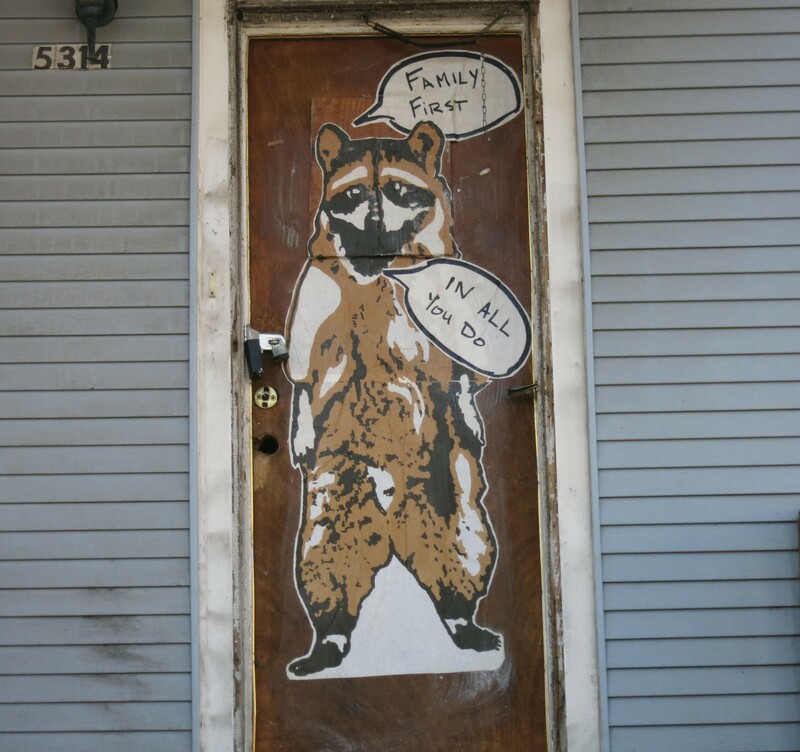 I found your blog because I am thinking about buying a boarded up house that has one of your raccoons. It’s actually the raccoon itself that made me stop and take a closer look at the property. It’s definitely a fixer upper (to say the least) but I feel like maybe your project is a good sign. Do you live in New City/Back of the Yards? If so, I’d love to ask you some questions about the neighborhood.